South Australian oysters are starting to come into peak condition at this time of the year, and will be at their best over the next two and a half months, according to Jeremy Pearce of Larners Oyster Supply. Fat , juicy and plump, they smell and taste of the clean, clear ocean waters of The Great Australian Bight. With nice layers of fat, the oysters have a smooth texture on the palate, that combined with the saltiness of the sea is irresistible. Combined with any of your favourite toppings, Kilpatrick or natural, now is the time for decadent gorging on these sensational molluscs. 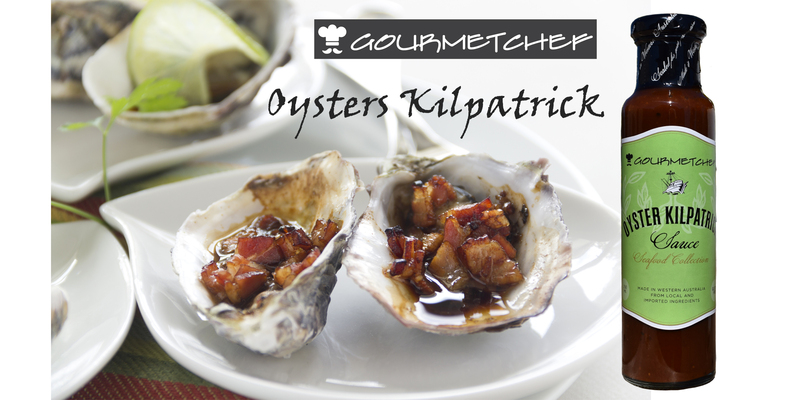 One of our favourite recipes for oysters is Oysters Kilpatrick, made with our special Kilpatrick Sauce. This recipe should not take you more than about 15 minutes. 2 rashers of bacon with rinds removed. Preheat grill on high for about 2 minutes. While the grill is heating, place the oysters on a grill tray. The oysters tend to fall over, so you can embed them in a generous layer of rock salt to keep them level. The rock salt can be used later for display purposes on your serving dish. Cut or chop the bacon into smaller strips or chunks and arrange them over the top of the oysters. Drizzle Gourmetchef Oyster Kilpatrick Sauce over the bacon and oysters. Grill for 5 to 10 minutes until the bacon is crisp.